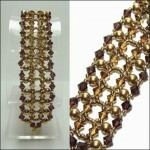 The Guinevere Bracelet pattern is now free! This would be a great tutorial for those looking to learn right-angle weave. Although I use bicone crystals and glass pearls, any 4mm beads and size 11 seed beads will work. Enjoy! Well, you asked for it, and here it is: a challenging little technique I stumbled upon using two-holed seed beads for right-angle weave. I don’t know what it is about right-angle weave that inspires me so when I play with my two-holed seed beads and my round druk beads, but right-angle weave is one of those beading stitches that just came naturally to me when I first started learning how to bead. Right-angle weave is one of those stitches that I can use to lull myself to sleep at night when I’m wide awake and can’t relax — there’s something about the thread path of this beading stitch that I find to be just naturally relaxing and meditative. After the busy Holidays I’m glad that I was able to find time to share another beading tutorial. Lately, I have been really fond of using Twin Beads. I spend hours experimenting and trying on different techniques to come up with a new beaded jewelry design. A technique that I find easy to follow and can be the starting point to several variations is the Right Angle Weave. Today, it’s beading basics on how to do Right Angle Weave Beading with Twin Beads. Before we start as you all know twin beads has 2 holes so we’ll try and be clear to which holes you need to pass the thread. We’ll call them inner hole or lower hole and outer hole or upper hole. Let’s start! When finished, these beaded rings make the perfect centerpiece for bold beaded necklaces. You can embellish them with more seed beads, hang spike beads off the bottom, or just attach them to a beaded rope and enjoy them.But best of all, when you use size 8 seed beads to cover them with right-angle weave, they only take a few hours to stitch, so you can create several of them in a weekend. Enjoy! This week I’m going to be looking at Right Angle Weave or RAW over two posts. Today I’m showing you regular RAW and Modified RAW, which is a wonderful new twist on transitioning from RAW to Peyote stitch allowing you to completely skip the first row of peyote.MRAW was developed by Kate McKinnon for her book Contemporary Geometric Beadwork.